Once again the weather showed its furry yesterday. A supercell thunderstorm yesterday afternoon has left a trail of damage through Muswellbrook. The storm developed near Mudgee and then travelled east - northeast. The storm hit Muswellbrook at approximately 5:20pm with strong to gale force winds and 9cm hailstones. The hail was the main contributor to the damage with insurance payouts expected to be in the millions. Roofing and car damage was the most common damage. This thunderstorm has caused the worst hail damage in the Hunter since the November 1996 Singleton hailstorm. 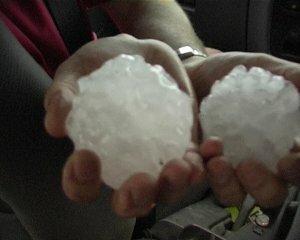 The size of the hailstones were comparable as the hailstones recorded in the devastating April 1999 Sydney hailstorm. Thunderstorms were very active across all the Hunter yesterday afternoon and evening, with many separate storm cells. Heavy rain, strong winds and small hail were observed in a number of other centres, including Maitland, Dungog and Singleton. The thunderstorms that hit these centres were not related to the supercell that hit Muswellbrook, even though many of them occurred around the same time. Thunderstorm activity yesterday was not out of the ordinary in regards to the atmospheric conditions. The surface temperatures were in the mid to high 20's, the lower and middle parts of the atmosphere were very moist and an upper low pressure still remained over the region following last weeks heavy rain and strong winds. Radar image taken at 5:30pm. The supercell storm can be noticed by the dark red strip just east of Muswellbrook. This is by far the largest storm of the season so far (our spring). This event developed along a shortwave that destablised the atmosphere and for once had at least some inflow from the east. Directional and speed shear was more than ideal for supercell development. David Croan, Geoff Thurtell and I with Jeff Brislane and Matthew Piper intercepted a supercell with very large hailstones and transitioning from a classic supercell to HP structure and then bowing out into a line structure a couple of hours later. The storms developed near Mudgee which is about two and half hours northwest of Sydney and became more HP near Muswellbrook north of Sydney. It devastated the region's grapevine crops. We intercepted this storm in its classic supercell stage. It was an incredible event though my vehicle has sustained more dents. I was very much concerned about the windsheild - some were shattered in the event. The hailsize in the picture were not the larger hailstone diameters observed - just whatever we could pick up when David Croan dared lean out of the car:) 10 - 12cm hail were mentioned in this storm backed up by David's estimates. In hindsight, we should have turned back and surveyed the hail size and damage. Jimmy Deguara is an avid storm chaser from Sydney, NSW and is a co-webmaster for the Australian Severe Weather website.